Vishal runs a dairy business and needs reefer vans or trucks on a daily basis. He faces issues on how to send his consignment safely and surely. Products such as dairy, seafood, poultry, and other such entities require delicate transportation under certain controlled temperatures. Refrigerated trucks or reefer vans help tackle exactly that. In cases as such, people like Vishal needs a handy guide on what would serve the purpose with absolute perfection. 1. The requirement of a certain temperature: Most goods of daily use degrade under a certain temperature. And you certainly don’t want to handle such products with carelessness. Also, some products don’t need very low temperatures while some require it mandatorily. This makes clear one thing- what goods you want to transport and at what temperature. One more thing to consider- how long you want that temperature to sustain, that solves a lot of initial problems. The need for the desired temperature would bring you to the right kind of vehicle ab initio. Surprising fact: Sometimes live animal/bird species, different technological equipment etc. are also transported by these vans and trucks. 2. The projected lifespan of the vehicle: Normally, such vehicles last for not more than 7 plus years. To state it specifically, 3 years for a super cool experience and the remaining ones for a satisfying one. The lifespan of such vehicles is less as compared to other applications. This points to one thing clearly- you need to get it replaced with an equally good van again after some years. To make the most of your truck, you must keep your vehicle’s lifespan in mind. It’s of no use if your vehicle’s high-density polymer foam insulator does not contribute to your economics. This would help target your business goals effectively. It saves a lot on re-buying such vehicles too. 3. Transportation, need and usability: Reefers derive their energy from the direct drive mechanism. This means that reefers are not everyday vehicles having an external power source. These vehicles use power generated from the vehicle’s main engine. Apart from the condenser, compressor, and an evaporator, reefers require this mechanism to work efficiently. Have clarity on the duration of the vehicle to be used. To put simplistically, you must know whether your goods need long-distance transportation or long-duration hauls. Long distance transportation doesn’t require a separate generator. But a long haul (in case of on-site catering or similar events) would require a separate power source to maintain the required temperature. Apprehending this beforehand helps you decide the basics. It would help clear the air on aligning your expenditures in the long run. 4. The payload and the drop-offs: No business can run on low margin profits. Neither can you take the value of savings for granted? You must know your payload well enough. If your payload is higher, naturally your stock gets transported quickly in more quantity/number. This results in a better economy result from the vehicle. Also, it helps in calculating your delivery rounds with precision. Better payload results into increased drop-offs. Better drop-offs attract a better chance of making a fortune. Simple maths! No hidden algebra here you see. A Fact to remember: For lighter or smaller commercial delivery vehicles, a Nose mounted refrigerating system unit is mostly recommended. For larger vans, trucks, and trailers a Roof mounted system unit is preferred. 5. It needs customization or not: All refrigerated truck manufacturers vouch for their products made. But do these really stand out to you? 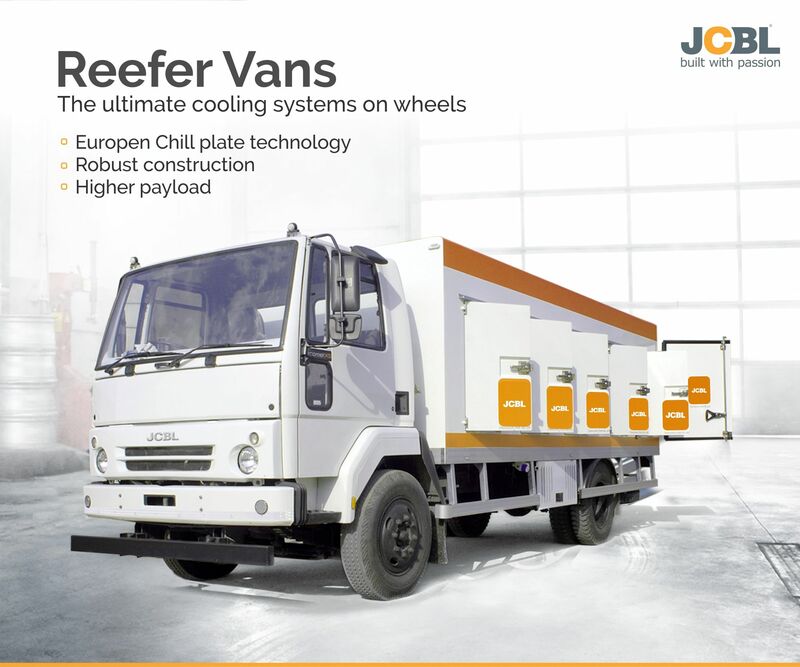 For example, you need a chiller van that can carry a customized cargo area (different temperature for different products so as to say). Do you require such dual temperature settings for your products? Or that you require an extra addition (like racks, wet load floor etc.) for your payloads to become economical for you. Does the existing vehicle make that difference? Does it stand out as a solution for you? In either case, you need to understand the fact of 5w and H (why, when, where, what, who/whom) of your vehicle. It is customary that you ask for bespoke requirements and whether you really need them. Set your priorities in order. 6. A perfect wheelbase to go with: Wheelbase affects the load space capacity. If you use pallets, then this becomes even more important. The three main types of wheelbase- short, medium, and long are the available options in the market. At JCBL, we deal with all the kinds of wheelbases. The unit measurements may vary according to the brand you choose. Having the right kind of wheelbase makes it easier for tackling transportation issues. Refrigerated trucks are modern day necessities. And these have made our lives better and easy as well. In truly deriving the best for your business endeavors, take care of these helpful tips. You can thank us later on in our comments section below. Have any such query or want a similar product. Reach out to us. We would be happy to help.